Rosa Schwartzburg’s writing has appeared in The New York Times, The Nation, The STAND, Bustle, BUST Magazine, The Bard Free Press, and many other places. She graduated from Bard College in 2016 and served as a Fulbright Fellow to the Netherlands from 2017-2018. She is currently working towards her MA in Critical Gender Studies at the Central European University where she specializes in analyzing white nationalist recruitment patterns through a critical feminist lens. She is also the Managing Editor of CEU’s student newspaper and an organizer with the Szabad Egyetem/Students for Free University. 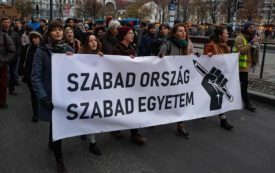 Though Orbán sought to stamp out dissent and free thought in Hungary, he only made us call out to one another in solidarity.